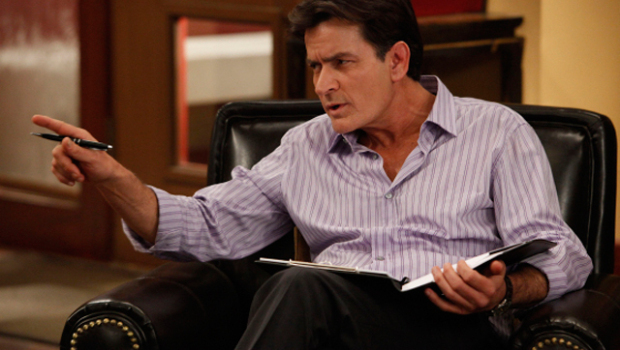 XOXO Jes - Canadian Entertainment News: Charlie Sheen's Anger Management...Pass? Charlie Sheen's new show Anger Management started tonight. Did you watch? Charlie plays, who else, Charlie...a therapist who does anger management group sessions with a bunch of angry peeps. Oh and he also is a player who dates hot chicks. There is no Alan in this show...no, Charlie takes on that role as well with his character having an ex-wife and a teenage daughter who is a little weird. I am not sure if this show is going to make the cut. One good thing though, Charlie doesn't look as coked out and ridiculous as he did in his Tiger Blood faze, but he still looks worn the eff out. We shall see if this cat has another life left in him. He has had to have used like, 20 by now.